10th Annual Speech contest, Bangalore division concluded successfully on 8th November 2014. 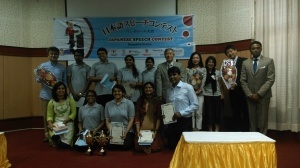 It was attended by learners as well as teachers of Japanese language and Japanese natives residing in Bangalore. The Winners of 10th Japanese contest -Bangalore Division are listed below. Three Cheers to these winners who will be representing Bangalore in the South zone contest which will be held in Chennai soon. The members of the “Jinsei doojoo -A Japanese English Bilingual club” were present in large numbers and were encouraging the participants enthusiastically. The event started with the invocation song by Arvind-san and welcome speech by the President of BNK ,Susheela Menon .During the break Oe-san gave us step by step instructions to make a paper crown to experience Origami . This was followed by melodious violin recital by Ryuichi Kato. On popular demand ,Kuboki-san enthralled us with a song in Kannada while we awaited the results. The entire event was coordinated by MCs Eswari-san and Movin-san .The Chairman of the speech contest committee ,Sugumaran Narayanan concluded the event with the closing speech . Thank you all the volunteers who helped in arranging things at the venue including snacks ! Your enthusiasm and support is what motivates BNK to conduct such events. Korekara mo yoroshiku onegai itashimasu .